Josie is back with more of some of her favourite places to eat in Chester that’ll be sure to inspire you for your next meal out. Why not start your year by treating your taste buds to something new and fantastic! We’d love to hear your personal recommendations, or perhaps you’d like to share your own experiences at some of these tasty places via our comments section below. Happy dining! You may recall a little piece I wrote a few months back on where the best places to eat in Chester are hiding. 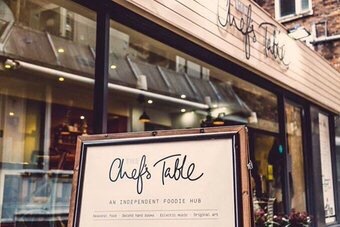 Well, I’m back with the sequel to feed your ideas of where to go for your next tasty experience in our lovely Chester. Tucked away down the Music Hall Passage, this little gem avoids the hustle and bustle of Chester’s main streets, known intimately amongst avid foodies and explorers alike. Recommended by a city dweller, I was certainly rewarded with the food and service I received. Visiting in the middle of November, I was welcomed into an intimate setting. The rustic interior of wooden floors, tables and chairs was warmed by candle light and the staff who greeted me were friendly and professional. With a seasonal menu, the dishes are prepared to order. Channelling the autumn themed flavours, I started with a pumpkin spiced soup enhanced with mandarin and coconut, and finished with feta and hazelnut, sage and onion focaccia (which is a type of bread for anyone wondering..!). As a lover of the ‘fish dish’ when it comes to fine-dining, I chose the roast loin of cod with truffle and mushroom gratin (crust), seasonal veg and potatoes, topped with cream emmental sauce. Exquisite! And to finish off, I managed to squeeze in a plum crumble accompanied with cheesecake ice-cream which was certainly worth every calorie. The menu isn’t endless, it’s carefully chosen and refined which makes it rather exceptional. As I’ve said before, a smaller menu can often give credit to the type of restaurant you are eating at – that is, fresh, carefully prepared dishes, that are unique to that particular chef. If you’re celebrating a special occasion, or you just fancy giving your taste buds a treat this is the perfect place to go. However, at this very moment the restaurant is undergoing a renovation of both the space and menu so is temporarily closed from 21st January to 9th February. Be sure to get your reservation in for the reopening – it’s sure to fill up quick – and enjoy eating the flavours of pure genius! Another independent restaurant, and the ‘bigger’ sister to Porta (which I recommended in my last article). Both are at the other end of Northgate Street, away from the main ‘go-to’ places in Chester. This award-winning restaurant also has a seasonal menu. And as it has changed since my last visit, I won’t make you jealous of what you could have had. Instead, I’ve looked into their newest menu and it sounds just as tantalising. Think Ox cheek, polenta, parmesan and crispy fried shallots or chargrilled bavette steak salad, pickled beetroots, finished with blue cheese and caramelised walnuts. Again, this place is a small, wisely crafted menu, and although it’s true I haven’t tried this particular menu, the reputation of the place along with my previous experience, almost guarantees sensational dishes and a perfect evening. Take a significant other for a relaxed, yet eloquent evening – Valentine’s Day is just around the corner – or treat a friend to a meal they’ll never forget! A popular choice amongst food lovers and those with a bit of quality Chester inside knowledge, so get your reservations in! Culture yourself with some authentic Japanese and Thai cuisine served in a typically beautiful eastern environment. Situated on City Road, adjacent to the train station, this is the perfect location to get home or, if you fancy washing down a great meal with some drinks, it’s just a short walk to the centre. I have had the pleasure of eating at both the upstairs restaurant and experiencing the fun-filled evening of the downstairs teppanyaki. I’ll start with the excitement of teppan-yaki. The menu has both A-la-Carte and set menus, and the dishes include sushi, soups and tempura fish as well as a range of meats which can be accompanied by noodles or rice. Enjoy as your chef juggles and dances with your food providing quality taste and first-class entertainment. Feeling confident? Why not attempt to catch some freshly made potatoes with your mouth! I took my family here to introduce them to Chester and show them why I love our little town so much. I think they’d agree that it was an all-round fantastic evening! However, if you’re looking for a slightly more low-key evening, head upstairs to the beautiful Thai restaurant, decorated with traditional colours and patterns of Thailand. Here, there is a range of all your favourite Thai dishes, and more! I’m a bit boring when it comes to Thai, or any eastern dish really, in that I tend to stick to the safer, milder options. But I have been here numerous times with people who are a little more adventurous with spices and they’ve all loved the place. For anyone who is like me and tends to play safe, the massaman curry with beef at this place is at a new level of amazing! Ah Italia, in the heart of our beautiful Chester and the last of my recommendations for today. This authentic, family-run Italian trattoria stays close to its Italian heritage by serving traditional dishes and homemade recipes. For anyone who has ever been to a ‘proper’ Italian restaurant in Italy, this place ticks all the boxes; a basic yet colourful interior with simple yet delicious dishes. This is the first Italian I’ve been to in England that actually made me feel like I was tasting real Italy. And, on top of great flavours, it’s kind to the wallet! This is a place that shows that all the glamour and fancy décor aren’t necessary if what you’re serving is excellent food. With typical pasta and pizza dishes and a range of meat and fish options, you’re sure to find a dish that is exactly what you fancy. Italian is a classic food choice amongst us Brits, but once you try Sergio’s, you’ll find it easier to spot an ‘English’ Italian from the real deal. Can’t afford a flight to Italy, head to Ristorante Sergio’s where you’ll get pretty much the same thing (minus the weather). Buon Appetito! So there you have just a few more places to add to your food bucket list! Chester’s a place full of little gems ready to be undiscovered and tasted, so break away from your ‘safety’ Nando’s (which is still a classic, don’t get me wrong) and try something new!